In case it’s not obvious: I completely agree with everything shared in this post. Transform our lawns, transform ourselves, transform our communities. I experience this daily, as I’m out front, meeting neighbors walking their dogs, talking with the next door neighbors as I plant, mulch or weed, having micro-visits with David’s dad as he stops by on his errand runs. A team of Australian researchers are using a non-invasive ultrasound technology to assist in removing toxic plaque and lesions from nerve cells commonly associated with the onset of Alzheimer’s disease. 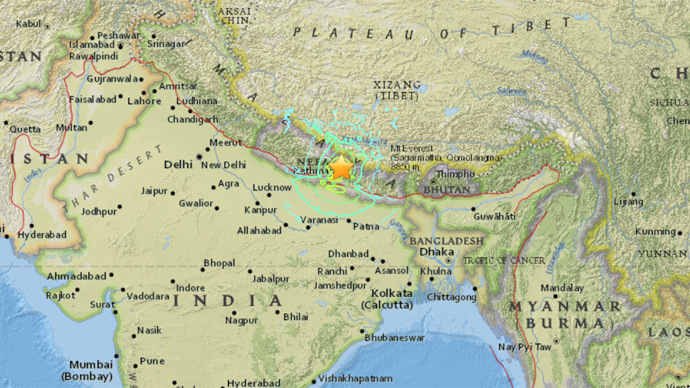 A 7.9-magnitude earthquake has struck 80km east of the city of Pokhara, Nepal, the US Geological Survey said. Some buildings have reportedly collapsed in the capital, Kathmandu. Witnesses say that the tremors were also felt in India. Shortly after the earthquake, the USGS raised the initial 7.5-magnitude of the quake to 7.9. Despite aerial bombardment, growing tensions with every neighbor, and the almost ubiquitous daily car-bombs, Israelis are “happier” than Americans according to Bloomberg’s world happiness index. Happiness, it appears, is most abundant a long way from the equator with Switzerland, Iceland, Denmark, Norway, and Canada all topping the list; whereas the unhappiest nations are all in Saharan or sub-Saharan Africa (apart from war-torn Syria and Afghanistan). Family members of Ervin Edwards, who died in a Louisiana jail after being arrested for wearing “sagging pants,” could not hide their grief and anger after seeing the video that showed him being tasered and left motionless on the cell floor. “The written reports are completely different from what’s shown on the video,” said Donna Grodner, the Edwards family attorney.